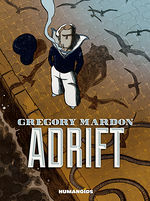 Gregory Mardon pays a heartfelt homage to his grandfather, who left from Northern France in the 1930s to enlist in the French Navy and went on countless globe-spanning adventures. A story full of tenderness, humor, and melancholy, told with keen insight and intimacy. Mardon crafts a poignant tale that’s ultimately about the people we call family, and what they mean to us. The choices we make concerning these kooky folks, and what that says about them and us and the way we choose to live our lives. In this way, Adrift will find a welcoming port in readers everywhere. Mardon’s loose black-and-white art captures Dodo’s energy and zest for life and the details that stand out in memory.